How Has The Rosary Helped You or Changed Your Life? 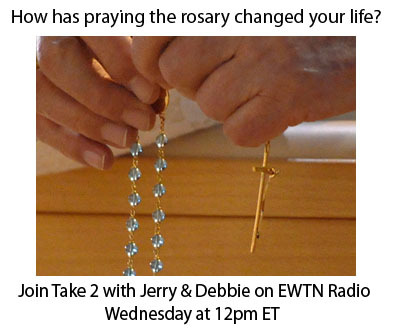 On Wednesday, Jerry and Debbie will take your calls and ask you to share your stories about the impact the Rosary has had on your life or the lives of people you love. We’ll be joined by Christopher Check, president of Catholic Answers, who will start off the show by telling us about the role of the Rosary in the Christian victory in the Battle of Lepanto. That triumph led to the feast we celebrate Wednesday – Our Lady of the Rosary. Be sure you tune in at Noon ET, or catch the re-airing of the show at Midnight ET! I was unable to listen to the entire show today and got in on the last part of Chris talking. Said there was a resource at Shop Catholic.com – wondered the name of the resource.